Use a simple Bow Tie block on point with pretty pastels to make this quilted treasure for Baby. 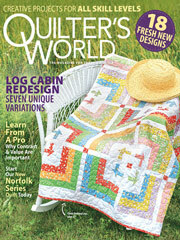 This e-pattern was originally published in the December 2012 issue of Quilter's World. Size: 38 1/4" x 51". Block Size: 9" x 9".